This relatively wild and challenging journey offers a true taste of Cappadocia’s finest landscapes, history and local hospitality without being too technical or physically intense. It connects incredible historical sights, off the beaten track villages and un-missable panoramas with wonderful cycling routes on dirt tracks, quiet roads and smooth flowing off road trails. The tour is a journey of discovery, spanning much of the region including the Ihlara Canyon, Soganli Valley, and “Fairy Chimney” lunar landscape that stretches from Mustafapasa to Goreme. It’s a mix of dirt road adventure bike touring, relaxed cycle touring and some great mountain biking that is suitable for all cyclists. The emphasis is on discovery, and there are plenty of sights, things to do and unforgettable photo opportunities throughout. This tour is a great choice for small groups, couples and families. Self guided tours include full hotel to hotel luggage transportation and airport transfers, leaving you to travel light. For self-guided programmes we provide a self guiding pack which includes detailed map, route directions, local info, language starters, details of sights along the way, and of course a GPS file of the whole route. Evening meals are included on the first four days and lunches can be added to your package, as can hotel upgrades. Shorter or longer tours are also available, and the option to have a car and English speaking driver on hand 24/7 is also there for extra security should you wish- please let us know if you wish to add this to your package. Cappadocia enjoys a continental climate of long, dry summers and cold winters, often with heavy snow. The best time to ride is May – June and September – October though the itineraries we offer are broadly possible right through from April to November. Fly to Nevsehir and Kayseri from Istanbul, with connecting flights worldwide. Turkish Airlines and Pegasus Airlines both have really good deals if you book in advance. Settled throughout time by Hittite, Persian, Romans, Byzantine and Ottoman civilisations, many of these caves are still decorated with icons and wall paintings from the early Christian times. Cappadocia is a land rich with history and filled with natural wonders. Click here to view the detailed itinerary. Bed and breakfast, with evening meal included on nights 2,3 and 4. 7 nights high quality hotel accommodation including boutique cave hotels and Ottoman mansions. Evening meals in hotel restaurants on 3 nights. Transfers to and from Nevsehir or Kayseri airport. All baggage transfers and use of support vehicle and driver where required. Self Guiding pack (route directions, maps and GPS files). Flights, lunches, entrance fees, guiding, tips, bike hire. 6 days multi centre road and off road touring on quiet country lanes, farm tracks and singletrack trails. 3- Suitable for most cyclists. A mountain bike fitted with off road tyres and ideally front suspension is required for this tour. Self-guided departures available from March to October. The tour looks interesting, do you have any maps that show the route? Me and my boyfriend are going to Cappadocia between the 4th – 19 th of july. During this days we want to travel around the area and maybe down to the south/discover higher mountains. We are interested in hiring mountainbikes during 2 or 3 days during this period – a self guided tour. Could you please send me some information about the price and conditions? I would love to have some advise regarding were the best mountain bike routes are. Hi Constanza. 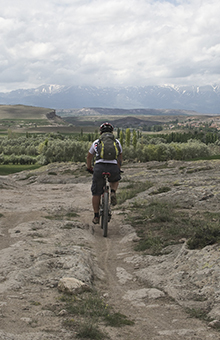 We can certainly help you with good quality mountain bike hire and advise on the best routes! I’ll send you an email with the details. Thanks! Is it possible to have one or two day self guided tour? Could you please send me some information? Thank you in advance. Hi Vladimir, yes, MTB self guided is possible, centre based in Goreme. I’l send you an email with some information. I’m also interested in a one day self guided mtn bike tour with bike hire if you could send me the same info please. Hi Stefan, Sure, one day self-guided is possible. I’ll send you an email. Cheers. could you please help me with a decision. Im highly interested in booking cappadocia-self-guided in March – April period. With high chance I will be single, my wife wont accompany me. I am from the events agency MCI in Barcelona. 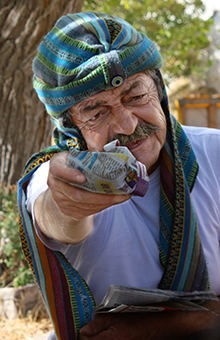 I am planning on coming on a exploration trip to Cappadocia at Easter with a small group of 6 to 8 people. Would you be available/interested to organise a 5 day trip. Whats the riding like at that time of year.